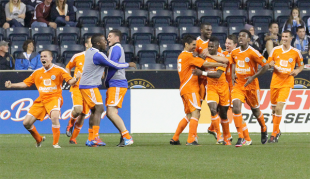 The Ocean City Nor’easter’s story book run in the US Open Cup ended Tuesday night with a 2-1 third round loss to Philadelphia Union at PPL Park. Along the way they gained some supporters, a few detractors, and a load of respect for their play. Ocean City came into PPL Park and tried to play their game. They stuck to their 4-3-3 with wide forwards, but didn’t play quite up high like they usually do and their top, skilled players had precious little time on the ball. But Ocean City stood toe-to-toe with the MLS team and nearly pushed the match to extra time. Nor’easter coach Tim Oswald spoke with pride about his team after the match, which he said was a great showcase for players on his team that have MLS aspirations. Oswald said he wasn’t surprised to see a nearly full strength Philadelphia line up face his team, saying the Union fielded a strong side because they to win the Cup. One thing Ocean City received at the end of the match may be rarer than any cup or trophy in sports. They earned a standing ovation in the River End from the Sons of Ben. I can think of no higher praise. Author: Greg Orlandini By day, Greg is an editor for KYW, the region’s highest rated radio station. Once a week, he enters the studio to interview some of the top names in soccer. Outside of covering the beautiful game, Greg is the bassist for the local band Zer0. Follow him on Twitter @GFO1025. They were organized in defense and occasionally dangerous on attack. They appeared well-coached to say the least. Congratulations to their players and their coach.